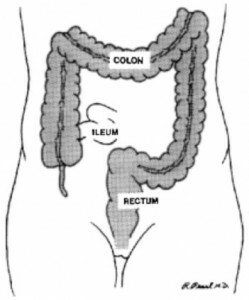 Initial treatment of ulcerative colitis is medical, using antibiotics and anti-inflammatory medications such as aminosalicylates. If these fail, prednisone can be used for a short period of time but long-term use can be associated with significant side effects. If prednisone is ineffective or cannot be discontinued, immunomodulators such as 6-mercaptopurine or azathioprine can be used to control active disease that does not merit hospitalization. In order to maintain control of the disease, aminosalicylates or immunomodulators are used on a long-term basis. “Flare-ups” of the disease can often be treated by increasing the dosage of medications or adding new medications. 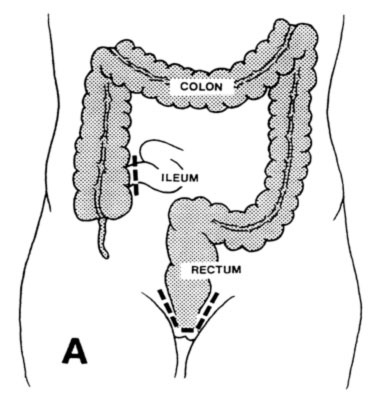 Hospitalization may be necessary to put the bowel to rest and deliver steroids directly into the blood stream. 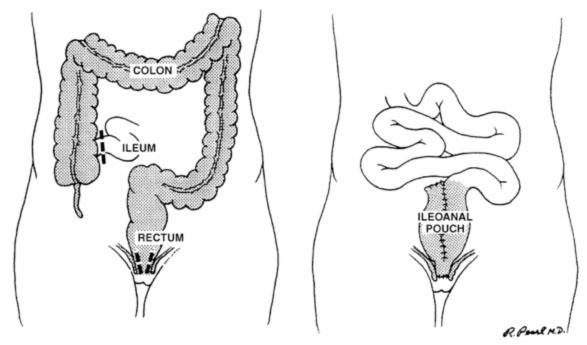 The continent ileostomy (Illustration C) is similar to a Brooke ileostomy, but an internal reservoir is created. The bowel still comes through the abdominal wall, but an external appliance is not required. 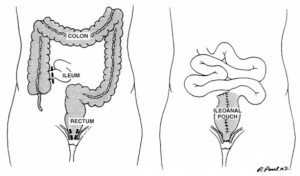 Instead, the internal reservoir is drained three to four times a day by inserting a tube into the reservoir. 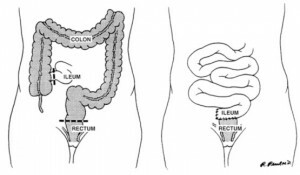 This option eliminates the risks of cancer and risks of recurrent persistent colitis, but the internal reservoir may begin to leak and require another surgical procedure to revise the reservoir. It is important to recognize that none of these alternatives makes a patient with ulcerative colitis normal. Each alternative has perceivable advantages and disadvantages, which must be carefully understood by the patient prior to selecting the alternative, which will allow the patient to pursue the highest quality of life.